What’s the one common element within all forms of digital marketing? If you guessed content, you’re correct. 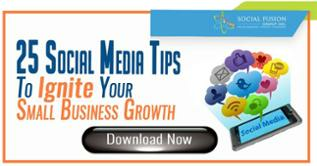 Whether it’s a tweet, landing page, or a paid Facebook campaign, you need content. Content is what drives your business; without it, your tweets will lack engagement, your website won’t be viewed by anyone (or picked up by Google/SEO,) and you'll be unable to convert leads without strong marketing copy. Now this is a heavy burden to hold, but you don’t have to be the metaphorical headless chicken running around. The digital marketing world is lucky to have tools to help drive business growth, and one of those tool is SEMrush. If you’re a marketer, SEMrush should be a go-to tool for growing your business. To start off, this platform helps with SEO, keyword research, competitive intel, social media analytics, and much more. Here's a quick overview we made about how you can benefit from SEMrush. 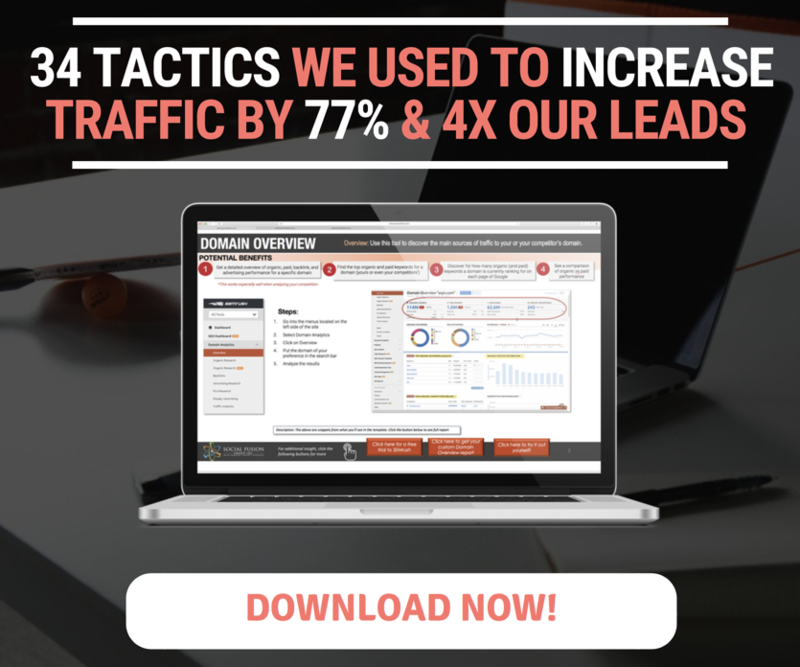 What if you're able to tell exactly what your competition is doing to drive organic traffic? More specifically, what if you could find the keywords they’re using to drive traffic and even uncover the content Google rewards them traffic with? Actually, you can; the first step would be to look at what type of content is driving the most traffic for them (aka what keywords do they rank for,) and compare it against yourself. Within SEMrush, all you need to do is enter the domain you want to analyze. CBS Sports is more popular when it comes to the keyword of 'nfl scores'. Because of this, CBS Sports should write more content on the topic and/or edit the current page to boost ranking and SEO. This tactic can trigger Google to perceive you as the more trusted source, therefore increasing your ranking. Uncover the differences between ESPN and CBS Sports to understand and analyze what they’re doing differently. Even though CBS Sports is more popular, ESPN is ranking higher. What if you combined your content with their page set up/strategy? Google could pick up on this (since you would be more trusted) and rank you higher, ultimately driving more traffic to your site. Let’s take a look at the blue highlighted section in this competitive analysis. SERP features are provided by Google to help the viewer get their answer quickly and efficiently. They’re usually located at the very top, or on the right column of a Google search. In order to be picked up as a SERP feature, you need to be ranked on the first page of Google. 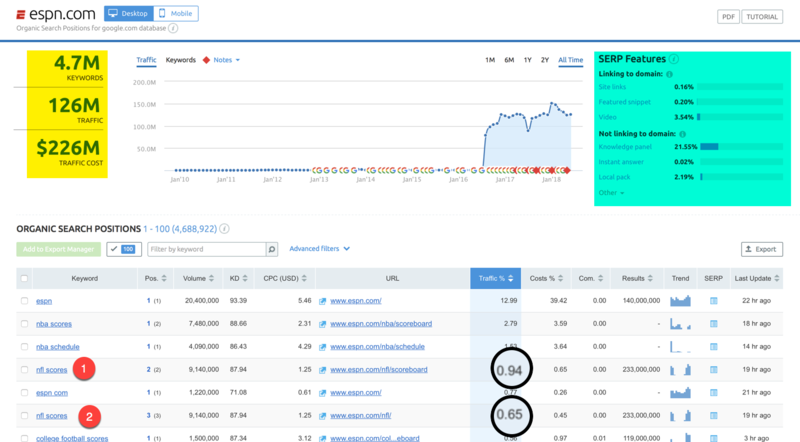 For more info on SERP features, check out this post by Moz. 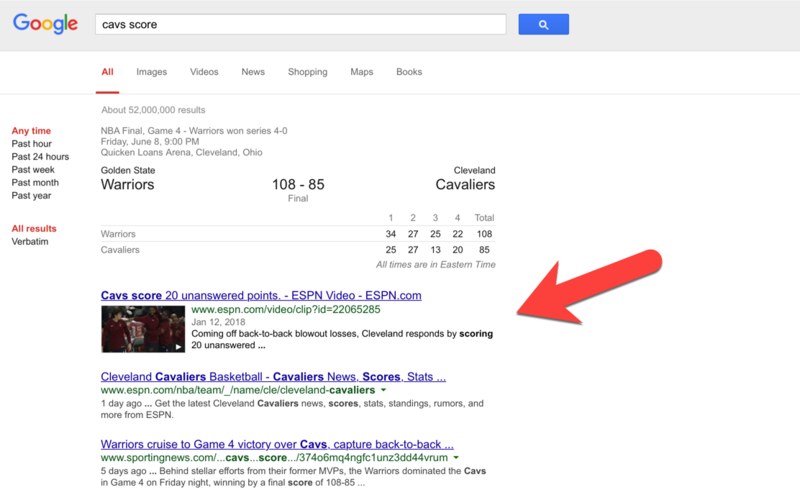 Taking a look at the screenshot above, let's use ESPN's 3.54% video SERP feature as an example. What this means is that out of 4.7 million keywords, 3.54% (roughly 166,500 keywords) will show a video SERP feature. Dig into specific keywords that trigger the SERP features and see how you compare. 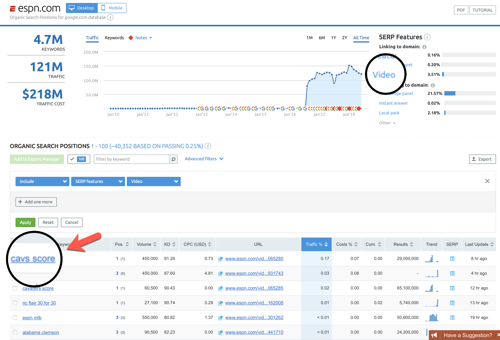 By simply clicking the video text, SEMrush pulls a list of keywords that will trigger a video SERP. Being in the shoes of CBS Sports, I’d like to know what they’re ranking for, so I can analyze their approach, and strategize my content the same or similar way. Let's take 'cavs score' as an example. Note: these images are reflective of the 2018 NBA Finals, if you search for the same term now, these results will not show up. This higlights a key SEO element - Google is consistently updating and monitoring search results, which make competitive analysis all the more powerful! Is there an opportunity here? The short answer is yes! Google favors content that is aligned with the searcher’s intent. However, looking at the keyword, you know once the next season begins, the scores will change and new highlights will be added, so its shelf-life would be short. Let’s say you do go after this keyword and attempt to out-rank your competitor on the SERP feature, you would need to start digging some additional competitive analysis. What type of content is the competitor using? Does it have any engagement? If so, how much? How did they optimize their page for SEO? Are getting backlinks that is contributing to their rank? If so, from where? Remember, in order to be competitive for the keyword, you need to be ranking on the first page. Just by answering some of these questions, you’ll start to see strategic content opportunities for your business. What if you don’t want to go after a short-lived keyword? Just take the same approach and look for more evergreen keywords. You’ve analyzed your competitor, filtered the keyword you want to target, but now you need a starting point. 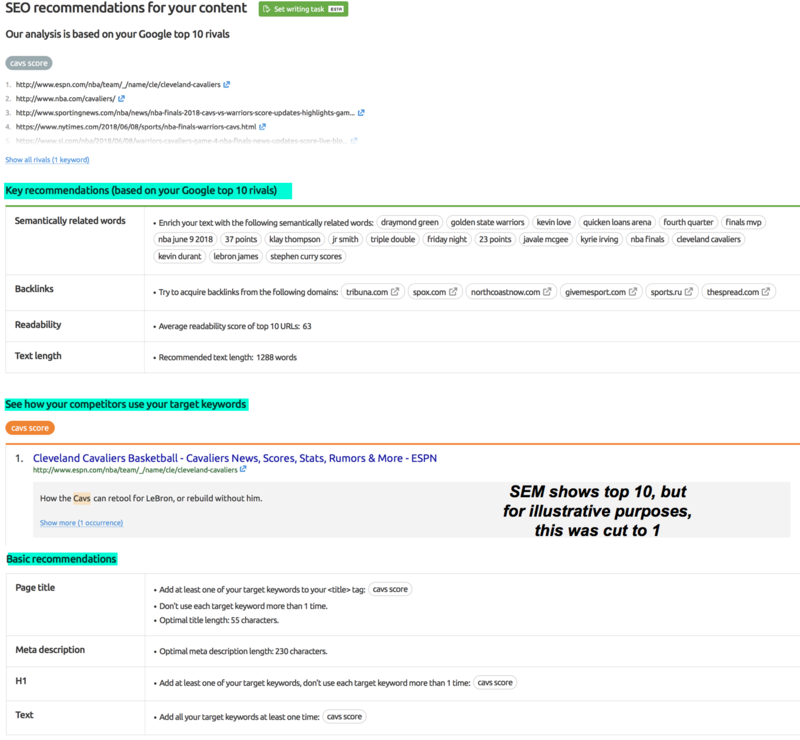 SEMrush has a built-in feature called SEO Content Template. It’s exactly what it sounds like, a content template based on helping you boost your site (and content’s) SEO. 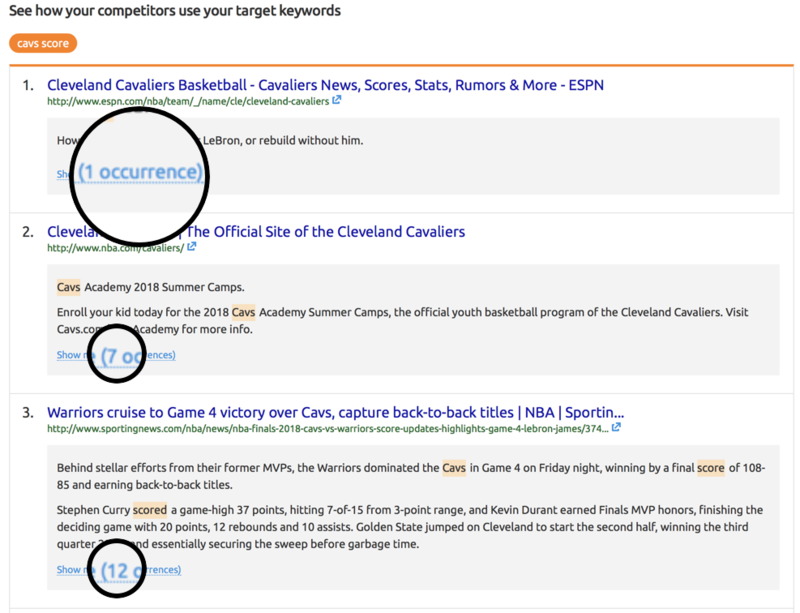 Using the same example, SEMrush analyzed the keyword of cavs score. At the very top, we can see the top 10 webpages competing for the keyword. Clicking the blue square, the webpages are easily accessible. The next section is one of the most important. SEMrush shows semantically related words (phrases you should include in your content,) websites you should try to target for backlinks, the readability of your content (based on the Flesch-Kincaid,) and text length. Note: these are recommendations based on websites currently ranking for the keyword. 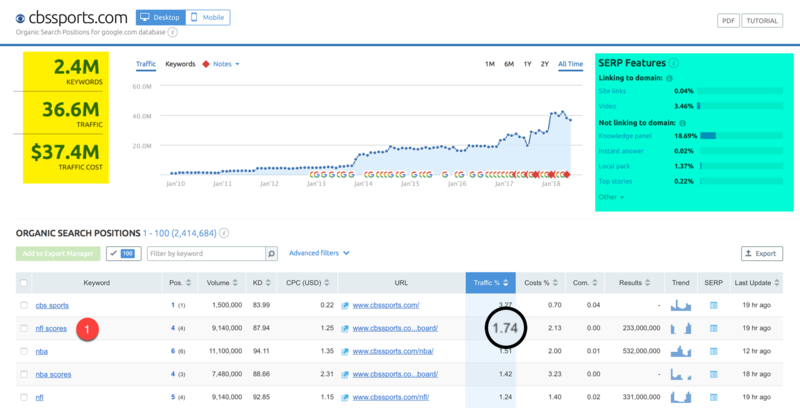 SEMrush then takes the top 10 ranking sites and analyzes how your competitors are using the keyword. For example, for the number one ranking webpage, ESPN only uses the phrase ‘Cavs’ once. The next 2 sites use the phrase, or variations of, Cavs and Score a combined 19 times. This information is valuable because you can now break down each sentence for SEO. Is the phrase hyperlinked to something? How often do they use the keyword in the post? Are stuffing their content with keywords? 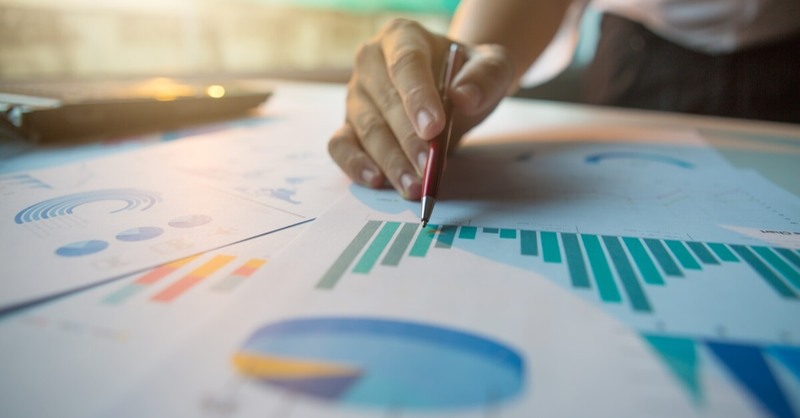 Generating insights into your competitors’ strategies in display advertising, organic and paid search, and link building. Want to try SEMrush for your business? Enter your domain below!